Classical pianist Van Cliburn has died, after recently undergoing treatment for bone cancer. He was 78. Cliburn is best known for winning the 1958 Tchaikovsky International Competition in Moscow—a triumph that was viewed as a massive victory for the Americans during those tense days of the Cold War. 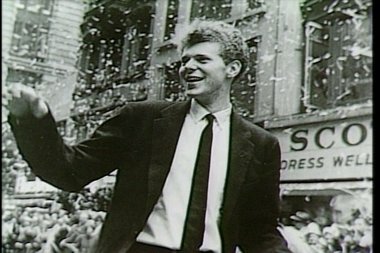 When he returned to the States, the 23-year-old Cliburn received a ticker-tape parade in New York that saw him greeted by 100,000 cheering fans. Cliburn was a Juilliard-trained child prodigy who had previously won the 1954 Leventritt Foundation award, which gave him his stage debut performing with five different orchestras. At a show with the New York Philharmonic at Carnegie Hall, he performed Tchaikovsky’s Piano Concert No. 1, which would eventually become his signature piece. His recording of that composition would go on to sell more than 3 million copies, becoming the first classical record to ever go platinum. After his Moscow win, Cliburn was similarly exceptionally popular for a classical music performer, playing two concerts at the Hollywood Bowl for a then-unheard-of $5,000 fee, plus two shows for more than 80,000 people in Chicago. Like his contemporaries in Elvis Presley or The Beatles, it was reported that women fainted upon hearing his music. In 1962, arts patrons in Fort Worth, Texas created the Van Cliburn International Piano Competition in his honor. To this day, it remains the most important piano competition in the nation. He received the Kennedy Center Honors in 2001, the National Medal of Arts in 2010, and performed for every single president from Eisenhower to Obama. But despite all the acclaim, Cliburn often felt hindered by his reputation, growing frustrated by his audiences’ desire to hear only the pieces he'd won with in Moscow. He cut back on live performances, finally retiring from the stage in 1978. Cliburn made a brief return in 1989, but only made sporadic appearances thereafter. (A performance in 1998 was halted when Cliburn suffered a panic attack and collapsed on stage.) The last time he was seen on stage was last September, when he appeared to speak—not play—at a Fort Worth concert honoring 50 years of the Van Cliburn Foundation.